Feeder is a British rock band that hails from Newport, Wales. The band is composed of a trio of musicians that started out playing with cover bands. Grant Nicolas serves as the bands lead guitarist and vocalist. He is accompanied by Taka Hirose on bass and Mark Richardson on drums. Richardson was a replacement for the band’s original drummer, Jon Lee who committed suicide on 2002, just after the band’s breakthrough year. The band released two albums Polythene and Yesterday Went Too Soon before they achieved mainstream success on their third album, Echo Park in 2001. This was followed by Comfort in Sound atr the end of 2002 for which the band was well received by critics. The album Pushing the Senses followed in 2005. 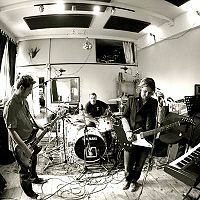 Their upcoming album Silent Cry is due for release sometime in mid-2008. Polythene (May 31, 1997)- UK #65, Certified Silver (UK). Yesterday Went Too Soon (August 30, 1999)- UK #8, Certified Gold (UK). Echo Park (April 23, 2001)- UK #5, Ireland #54, Certified Platinum (UK). Comfort in Sound (October 21, 2002)- UK #6, Ireland #27, Certified Platinum (UK). Pushing the Senses (January 31, 2005)- UK #2, Ireland #16, Certified 2X Gold (UK). Silent Cry (June 16, 2008).